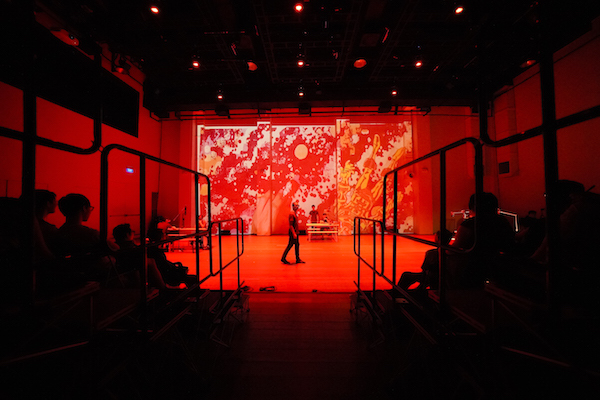 Becoming Graphic is both a meditative and mediated performance about living and dying. 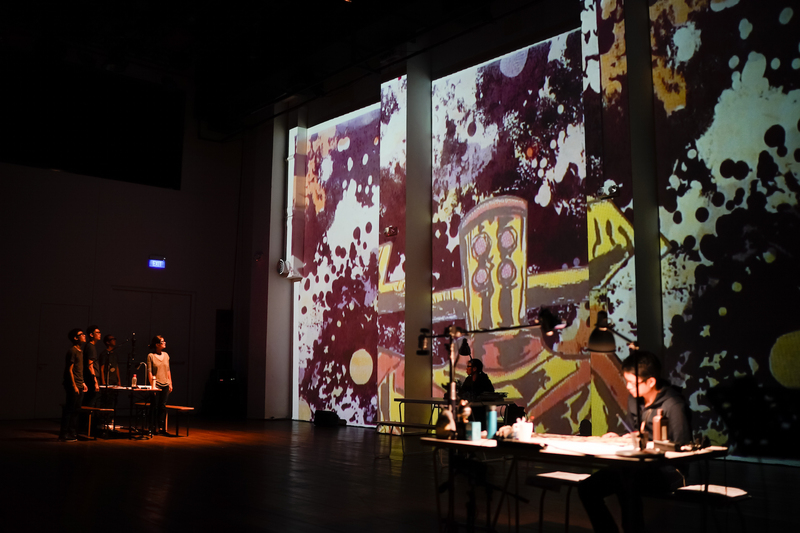 Commissioned by Singapore International Festival of Arts, graphic novelist Sonny Liew and theatre practitioner Edith Podesta come together to create a cross-disciplinary performance that breaks boundaries. The parallels, and thus the comparisons, between two forms—theatre and comics—are brought to the fore. To dissolve their distinctions and bridge the differences between them, Podesta introduces the radio broadcast as a framing device and interweaves Brian Gothong Tan’s multimedia designs into the performance. Through Podesta’s direction, Becoming Graphic tightly shifts from graphics to enactment of those graphics, from panels of Liew’s new unfinished series, “Black Oyster” and “Green Bolt” to personal monologues and recorded interviews with Liew and his family. Between the heavy use of mediation, Liew sketches live—the outlines are prepared beforehand and he inks over the tracings and completes them. Through the simple gestures of penning, sketching, and painting, ink over ink, Liew’s actions unravel the ‘wrinkles’ (to use a word used in Koh Wan Ching’s monologue) as strokes of time. The multimedia then rushes in to fill in the gaps of the performance and explodes into a visual and auditory spectacle. In effect, a brief history of media in Singapore is gathered—from print (an issue of ‘The Green Bolt’ was attached to the programme booklet) to radio, theatre to film, and to the impressive multimedia design, pieced together and juxtaposed in sections or panels on stage. There’s even an OHP projector! The performance opens with songs about “Sunny” (a cheeky reference to “Sonny” who is quietly at his desk). Podesta then openly reveals what is usually kept hidden: the production team—the stage manager, designers, video and sound operators, and assistants—on stage, supporting him and the creative team, behind their desks as well. Becoming Graphic thus becomes a commentary of the creative processes and the (backstage) actors who shape the performance. At the same time, Liew’s ‘backstage’ extends to his life: we hear about his stories (or his ‘Origin’ story, a comics convention) and snippets of him growing up through pre-recorded interviews with his parents and grandfather. Liew’s technique is mesmerising to watch: his strokes are assured; an accumulation of muscle memory and cultural memories of the many comics he had read and studied, most of which I had also read and loved growing up. Sonny could draw his graphics because of what others have drawn for us. Nevertheless, he also drew anew his pockets of memories, refashioning and renaming characters, re-narrativising heroes and heroines—Henry Li, the name of his action hero, switches to the nameless Presenter (Koh Wan Ching). As a parallel to the backstage and liveness of theatre, the performance delves into the struggles of taking care of elderly loved ones—Presenter reflects on her struggle of looking after her mother who has dementia. Her monologues are told simply and directly to the audience, and the simplicity becomes powerful amidst the overwhelming flashes of drawings, recordings, and quick reenactments of comic strips. That is when the performance resonates the most: it is the actors’ bodies, in comparison to other technological mediums, and their attempts and failures to compose perfect figures and heroes in the comics, that remind us of our finitude and mortality. 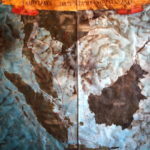 One can then also see Liew’s graphics as his attempt to understand and redraw life into graphic existence. Podesta thus sets up comparisons of and interactions between media—no one medium can truly preserve the human body; there are only attempts. This is most clearly seen in Henry’s (Crispian Chan) double-life as Green Bolt. Through Chan’s deft voice-acting and the movements of his body, we see a gradual yet demanding physicalisation of Green Bolt. Eventually, Chan wears Green Bolt’s costume onstage, and it is both absurd and heartbreaking, for Chan can never fully be this hero. Along with the other ensemble actors, Nathaniel Tan, Hu Yuheng and Chng Xin Xuan, the heroes and their sidekicks are animated; imagination somewhat becomes live. 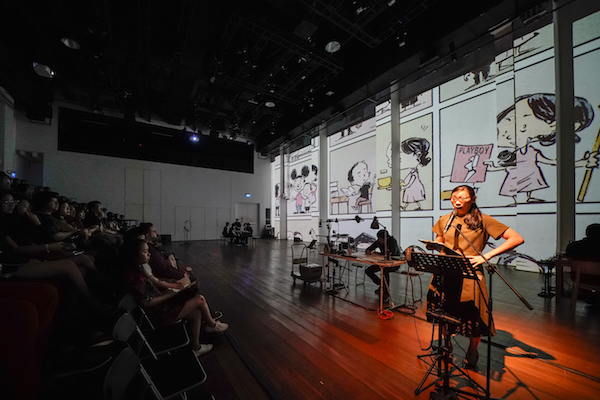 Further, Liew remediates bodies on stage and brief mentions of elderly bodies into cartoon characters, while young bodies enact them live and projected videos animate them. We never quite see the elderly bodies—just drawings and depictions of them. One is always reminded that they are imagination briefly represented on stage. Actors use objects to create auditory illusions, such as the diegetic sounds suggested by the comic panels. In that sense, those overwhelming technologically mediated moments serve to highlight the more tender and revelatory corporeal moments. Towards the end, the villain (introduced in the comics strip) appears on stage and reveals himself to be Liew. There are no true heroes in reality. Or is there? I almost miss the playful intertextuality within and beyond the comics medium present in The Art of Charlie Chan Hock Chye. 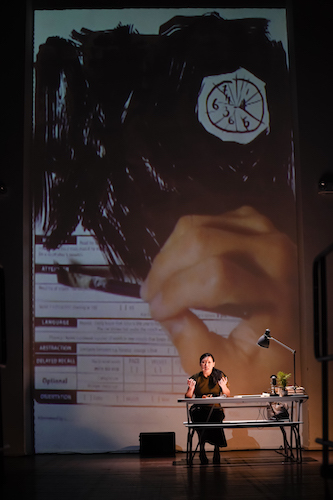 Although the performance did not set up to replicate that sophistry in Liew’s narration—alternate histories and the role of fiction in nation-building—the attempt to mix media repeats that playfulness. However, there are minor aspects of the radio broadcast framing that cause me to reconsider its function in this meta-theatrical performance. For instance, the voice recording of Liew’s grandfather’s interview in Mandarin are almost drowned out by Presenter’s onstage English translation. 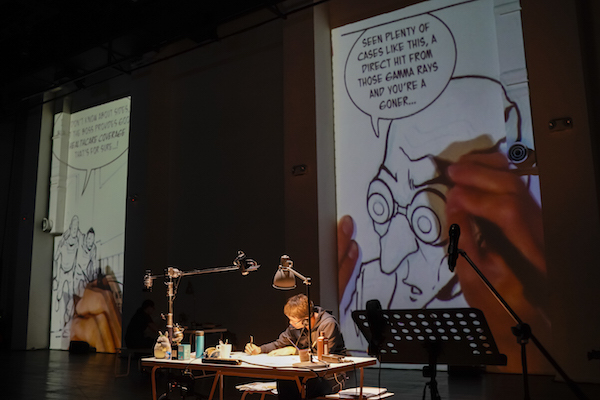 Similarly, as Liew draws the expressions of his characters live, it is juxtaposed with recordings (played at an increased speed) of him drawing the other aspects of the comics. I am struck by how video is so much more domineering than theatre is. But Liew continues to sketch. The actors enact their heroes again. The narrative of Green Bolt (and Black Oyster) resolves into an allegory of all the first drafts of creative works, all labouriously produced and repeated until, in some form or medium, they come into being. Each mediated space preserves memory differently; some are better than others. At the back of the programme booklet, we see Green Bolt’s comment: “…there are also spaces less practical, where memories of friends and adventures are preserved.” Theatre is perhaps such a space. After Presenter delivers her final monologue, she opens the stage door, leaving the stage and revealing the outside world. Becoming Graphic is, like the title suggests, about the perpetual negotiation with life—a mix of preserving life in graphic form as we embody the forgetting. The actor Koh fully encapsulates this, delivering a monologue that oscillates between acting, remembering her lines, and being true to life. However, Presenter/Koh does not need to leave the stage. 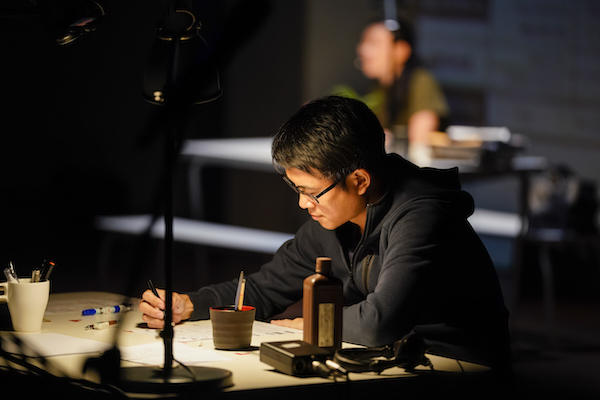 Through theatre, Liew now draws beyond the panels of the comics medium. Through theatre, a live audience shares the space with Koh/Presenter. Becoming Graphic thus showcases the support system put in place (SIFA, managers, designers and assistants) that makes all creative mediums possible. Indeed, time is a bomb, Green Bolt tells us, but it is also a condition for developing a good piece of theatre. This work holds up to this and I admire the whole creative and production team for its courage to focus on theatre’s inadequacies. Parallel to this, then, is our mortality in relation to our struggles in taking care of our parents. The theatre medium could be woven together more and over the other forms. But that’s the thing about mediated performances; they record and somewhat preserve the dying bodies. At the same time, they remind us that to become graphic entails an eventual disappearance. A body dies whilst becoming graphic. Guest Contributor Alvin Eng Hui Lim is a performance, religion and theatre researcher. He holds a PhD in Theatre Studies from the National University of Singapore and King’s College London. He is currently Postdoctoral Fellow at the Institute for Advanced Studies in the Humanities (IASH), University of Edinburgh, and Senior Tutor at the Department of English Language and Literature at the National University of Singapore. He is also the Deputy Director and Technology and Online Editor (Mandarin) of the Asian Shakespeare Intercultural Archive (A|S|I|A), and Editor of Theatre Makers Asia. His review is based on the performance on 20 August 2017, 3pm. It was one of the only two shows when daylight spilled into the white box space of 72-13 as the Presenter opened the stage door.